This blog has started off in a very retrospective vein. 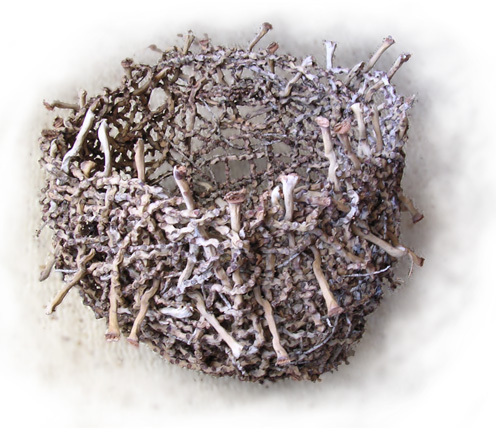 I will get around to talking about the present day eventually, but as the blog is called a basket maker’s “journeys” (that word so much beloved of reality TV shows), I first want to describe my early days of basket making. Several months and several experiments after making my first random weave baskets, I discovered that an expert basket maker, Virginia Kaiser, was offering basketry workshops nearby. I attended two of Virginia’s workshops and began to learn some proper techniques, and to understand and harness the urge that led me to make those first baskets. I bought every basketry book I could find and began to teach myself other techniques. I started collecting and experimenting with many different plant materials. In 2004 I sold my first basket through a local gift shop. Here is a photo of that basket, which I called “Busting Loose”. It was made from inflorescences (flower stalks) of the Bangalow palm tree. Love your blog Meri, it looks very smart, I look forward to seeing more. Thank you again for the week’s basketry course at Sturt. I’ve got a notebook beside me all the time at the moment drawing ideas to use the techniques you shared.